Parthenon — Meeting New Friends and Opa!!! A few weeks ago, I received a flurry of email notes bearing good news and invitations. 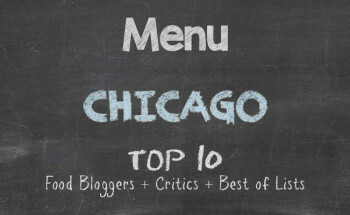 I found out that Chicago Alphabet Soup had made the list of top 50 blogs in Chicago, which was an honour given this is a hobby and balance to my otherwise chaotic day job life. I received a few emails inquiring if I would be interested in guest writing for a few online publications. Getty Images picked up a few of my photos. And I got an invite to Greek restaurant Parthenon at 314 S. Halsted Street in Chicago’s Greek Town. I thought this would be nice, so that I could put faces with the names of several foodies and food bloggers in the city. We had a variety of appetizers. 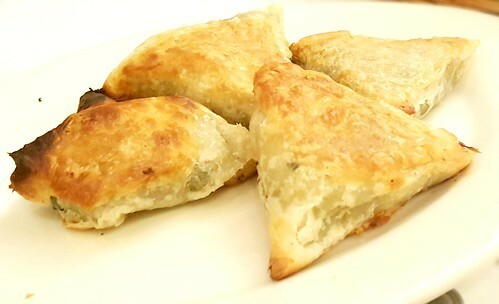 There were spanakopitas, which were phyllo pastries stuffed with spinach and feta cheese. 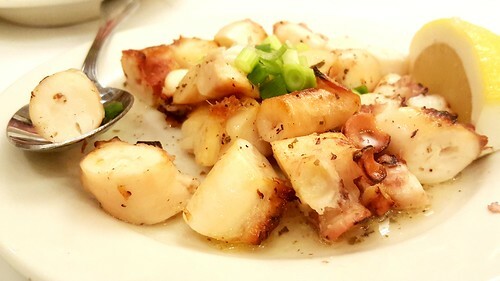 The octopus was not rubbery to the palate. It was as though the morsels had been cooked slowly for days. 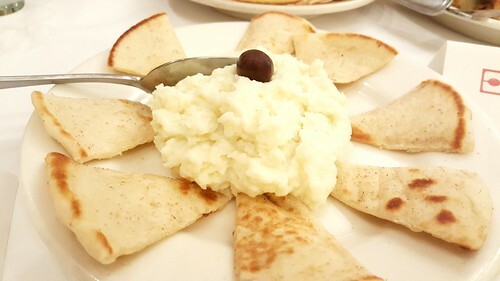 My first favourite appetizer was skordalia. Puréed potatoes accented with garlic, and I appreciated that the garlic was heavy-handed in the recipe. And, no, I have no fear of vampires. 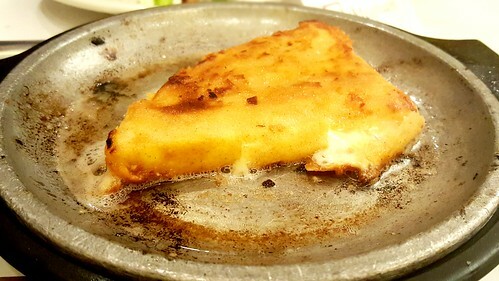 My second favourite appetizer to arrive at the table was saganaki. If you think the ritual of setting the cheese aflame and the shout of “Opa!” is spectacular, let me be the first to say that you’ll want to cut through all that fanfare and have the cheese set in front of you so that you can show your appreciation or devout appetite accordingly. The most pedestrian course, as I jokingly call rabbit food, was actually good. The salad dressing, albeit light, was still good enough to let the flavour of the ingredients come through. 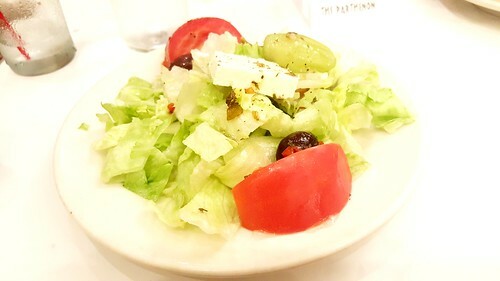 Lettuce, pepper, olives, feta cheese, and an addiction I call tomatoes were a great segue to the main course. 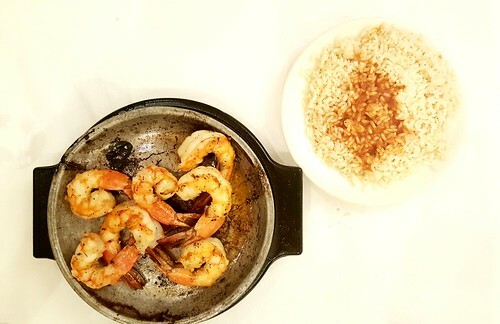 With so much tasty preamble, a dish that I thought would sate me without leaving me needing assistance walking thereafter was shrimp flambé with rice. The shrimp, doused with brandy and set afire to a declaration of “Opa!” before being set in front of me, I felt slightly ashamed at devoting the remainder of my time to devouring the shrimp and enjoying the rice. The best way to get conversation out of me during dinner is before serving any delicious food or by serving something quite not all appetizing. Having indulged so much food to this point, I cannot believe that I opted to renege on my intention for no desserts until Thanksgiving. Being aggressive with my workouts, I ordered galaktoboureko anyway. 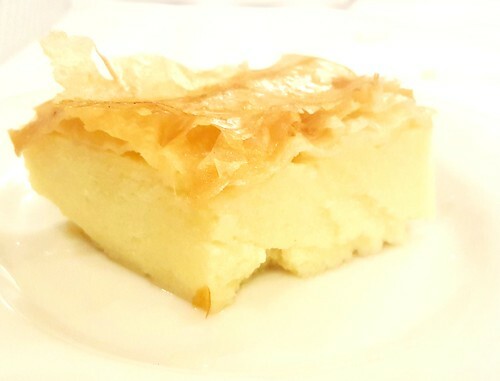 I am a fan of custard and this Greek delicacy prepared with custard and phyllo and then coated with honey was actually lighter on the stomach than I anticipated. The texture was fluffier than the creamy variety that I have gone overboard on in the past. Parthenon is large like many banquet halls. There is plenty of space for large gatherings and if you love to dine with family or large parties of your friends, this is definitely the place. There are two Greek restaurants in Oak Park that I frequent because of the quality in the food and service. I can say without hesitation that the quality of food at Parthenon is top. With this being a planned event — that being a gathering of foodies, foodists, bloggers and food appreciators — the service was superb. I shall have to return as a Regular Joe for a proper “off the street” dining experience. I’ll be sure not to shout “Opa!” and smash my plate against the floor. I wish I had done video. Didn’t have the camera that would have captured it with good quality. The saganaki was delicious.